This seems a lot less noble than the other thing. I want Nintendo to hire Grezzo for a new 3D action-adventure IP on 3DS. 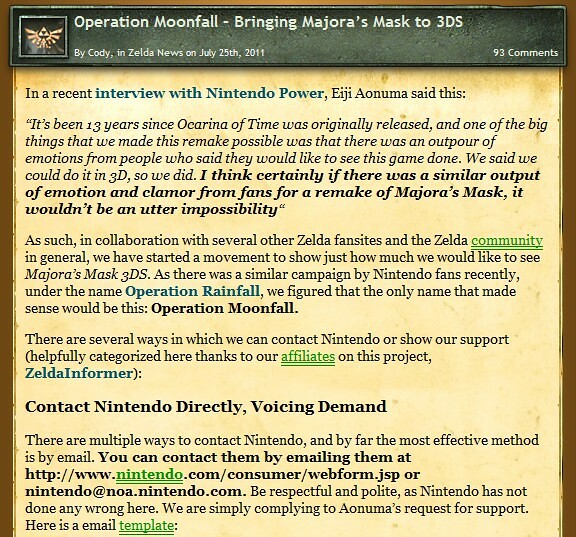 I wouldn't want them to drop the development of a new Zelda for a remake of MM. Oh I have an idea. I want to see an HD Yoshi's Island. Let's write to Nintendo about that. We can call it Operation Eggfall. It's completely different to hit up Nintendo en masse with another "demand" for a game that doesn't even exist, and is yet another port, on a new system that does have games coming out for it. Pick your battles out there Nintendo fans. Wait, what was done to alter the Water Temple in OoT? I like the name, after all the Moon does fall in MM. The water levels were color-coded. The big change that no one brings up is that there's now a cutscene showing you where a hidden room is. That hidden room contains a key that you can easily miss, and is the bane of all Zelda players' existence...s.
You mean the one at the bottom of the central tower? It's called a map. Use it. It really wasn't that hard. Actually, in the original OoT, the cutscene that shows the water going up in the central tower also shows the floating block rising and the hole beneath it. The hidden hole that you uncover by raising the water level up. Hysterics over the Water Temple amuse me. They reinforce my self-perception of being a gamer of superior skill . I don't think it was that bad, I just think that that certain key was the easiest one to miss. Well, and the one behind the bombable wall, but that one's more like "Woohoo, finally about to beat thi- crap. I need a key. I BET IT WAS BEHIND THAT BOMBABLE WALL." You break even, Zelda fans. Quit now. Like I've said on the Zelda board on this very topic; it's not like this is coming out of left field. It's a little counter-productive of the guys to use the same "Operation: __________" think, since people just automatically assume it's a long list of demands but Eiji said with enough fan outpour they would likely put it on the 3DS. Plus, like the original, in which he "cheated the system" by reusing a lot of Ocarina of Time's assets, the same can be done here. It took the original team a year to make the game. I don't doubt that it could be redone in less time. Just put GREZZO on it, have them wrap it up, and then have them do something else. The Zelda team isn't going to splinter off into a handheld Zelda until Skyward Sword is basically done. And even then, you've got a year or two before we ever see it. Yeah, it's not really much of an Operation. Sorry, I didn't mean to sound unnecessarily grumpy about this. 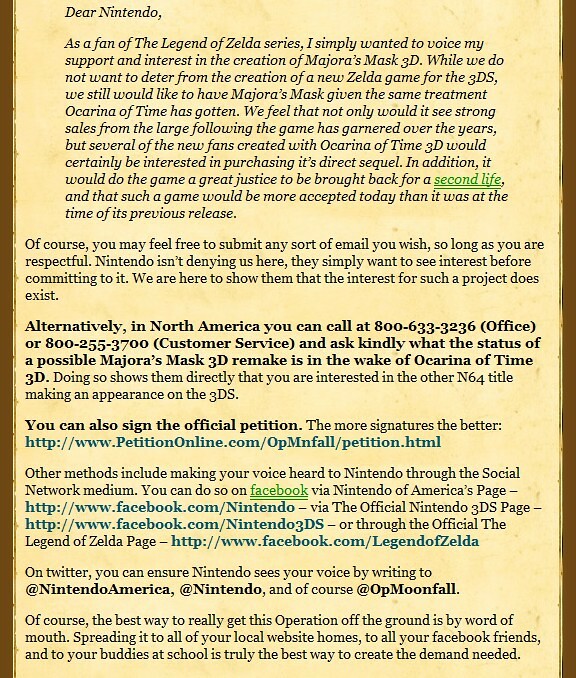 I'd support a remake of Majora's Mask and, if Aonuma says he's listening, I don't have a problem with fans of the game speaking up about it. I suppose I just feel a little burned out on these fan organizations right now. Not to mention remakes of N64 games. I definitely feel like all of these Operations are going to water down the main one, which is still the most important one in my eyes. 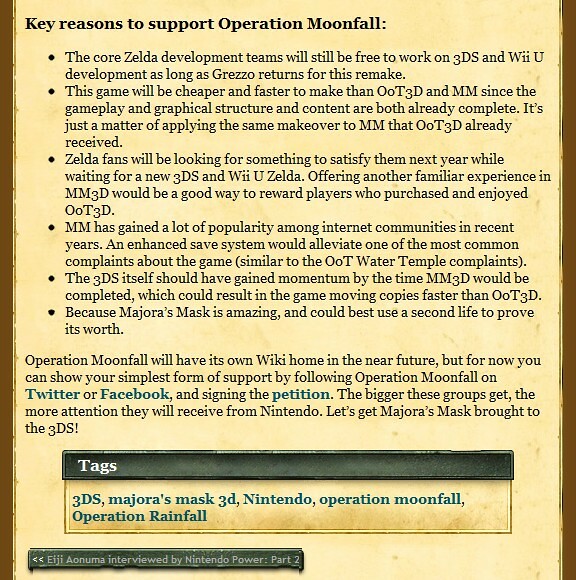 I thought it was cheesy that Rainfall used the word "Operation" in the first place. Like it's some military movement or something. That sounds like something that came out of the mind of people who spend too much time playing video games, I'm sorry to say. Just call the organization Rainfall and be done with it. That's my unsolicited opinion. I'm sure they were waiting to hear it. Sir. We have the Fries made but after a strategic meeting we have decided not to allow people to order Fries in States that are Blue.